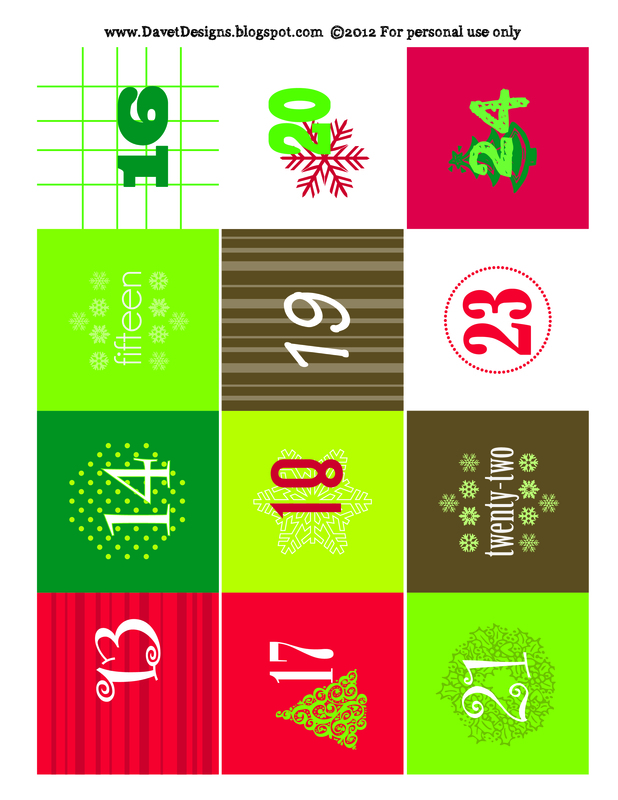 It has been quite a few years since I've had or even thought about an Advent calendar. But now that I have a family and baby, I thought I'd like to start the tradition of one with them. 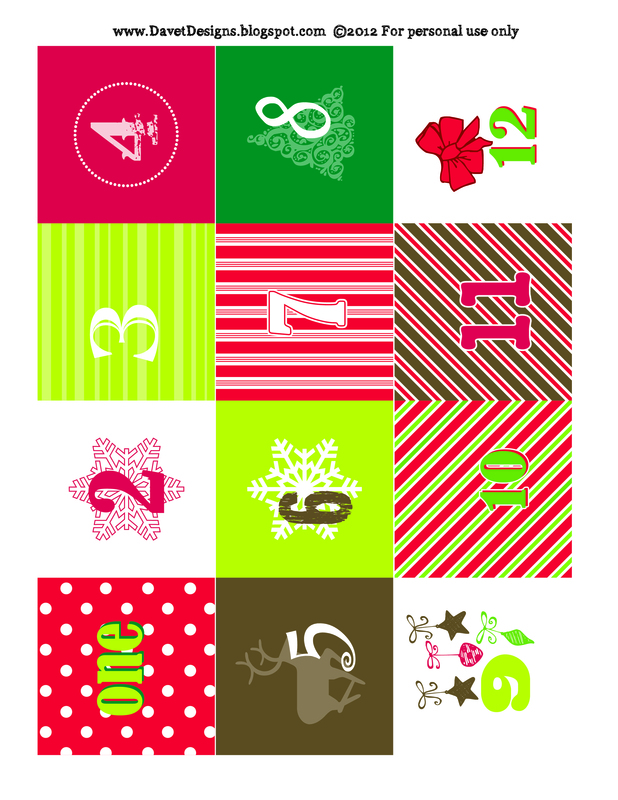 I searched the internet for advent calendars and found the perfect one by Makoodle. I made a few changes and this is what I came up with! I purchased the 12x12 magnetic back frame from Michael's for $11.99 on sale. I didn't realize they even sold them until I had already sent my husband to Lowe's for a metal sheet for him to cut down per Makoodle's instructions. I was shopping for a 12x12 inch frame at Michael's and hit the jackpot. At Michael's, I also purchased the 30 count Wilton brand favor tin kit for $19.99 minus my 40% off coupon. 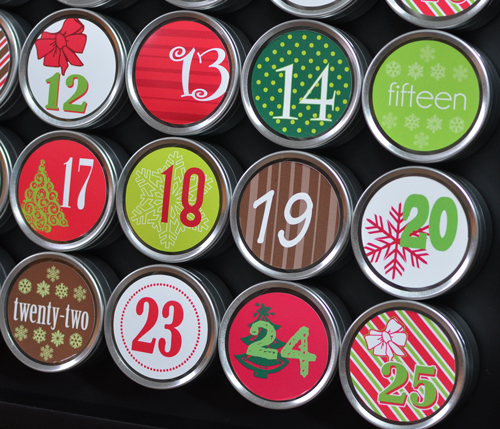 Cut your magnet strips into 25 pieces (unless you purchased individual pieces). 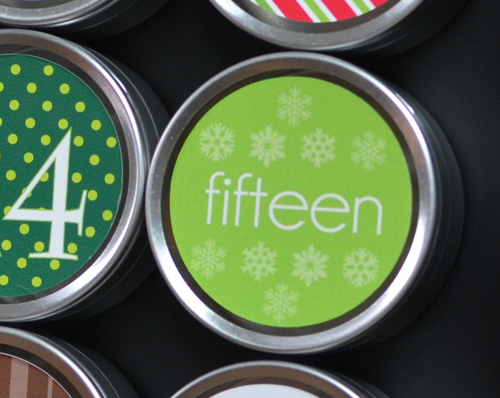 Stick a magnet onto the bottom of each favor tin. After a few days my magnets started to fall off and I had to go back and hot glue them. They will then stick to the inside of the magnetic frame in 5 rows of 5. I thought of a few other ideas at this point for another project using the magnetic frame and tins when I reached this point. 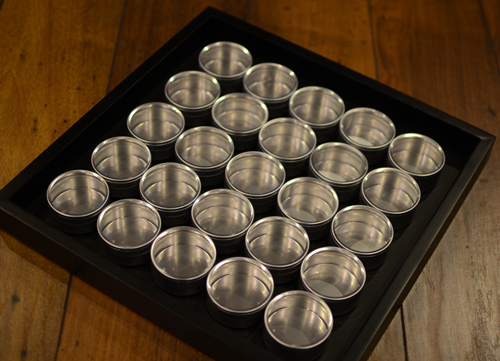 You could use the tins to hold little things and maybe make a game with the kids. Sounds like I just set a challenge for myself! There are several ways you can make the numbers for your calendar. 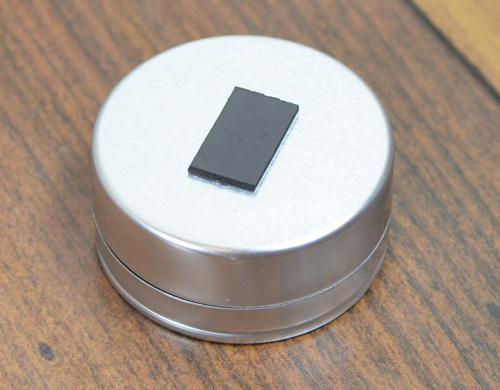 I printed 1.75 inch stickers since I liked a little bit of the clear window showing a peek into the tin. I used my commercial printer. 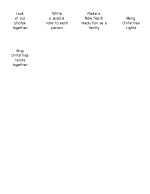 At home, you can purchase 8.5 x 11 inch label stock from your office supply store and print the free printable downloads (see below) of the artwork (or create your own) on your home printer. You can also take the files and the stock to your local print shop and have them print them for you. With the 1.75 inch hole punch and punch each one out. Just stick the number to the top of the tin. 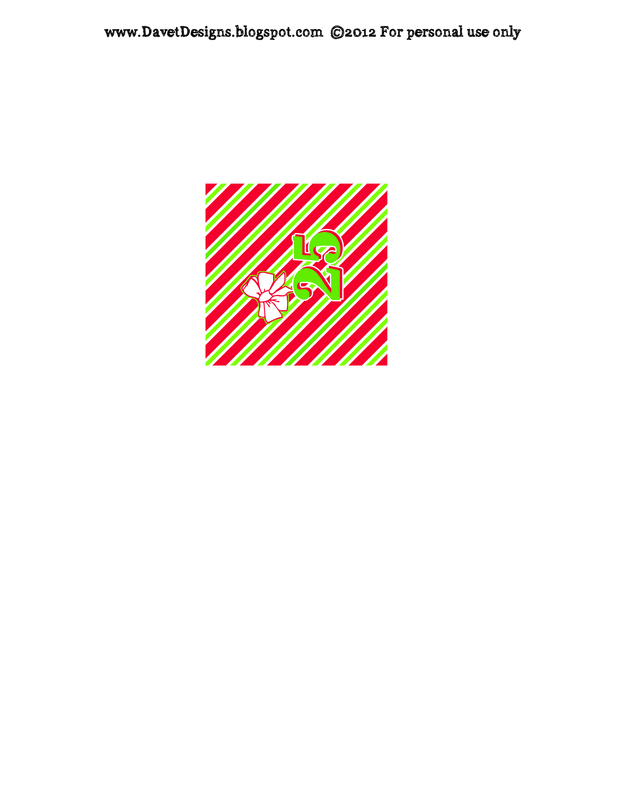 Another way is the method used on Makoodle's post. 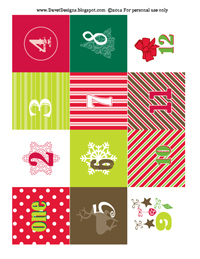 Just print the free printable download onto cardstock paper. Punch each number out with your 2 inch hole punch. Cover the front of the cutout with Mod Podge glue. Glue it to the INSIDE of the lid and let dry. 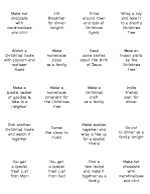 For the inside of the tins, I printed family activities (see free printable download below) onto colored scrapbook paper. 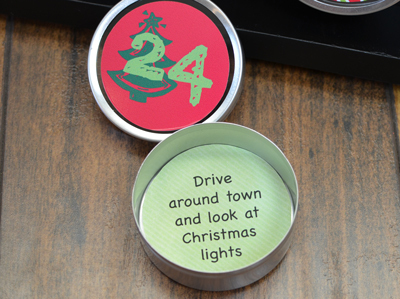 Using the 2" hole punch, I cut out the activities and placed one in each of the tins. I also put 2 candy treats in each tin (one for me and one for my husband). Handwritten notes might be nice as well and the kids could help. Copyright for free downloads and printables is owned by Davet Designs and is for personal, non-commercial use only. While these are completely free for personal use, please consider donating $1 (or more if you wish) to the Baby Helmet Project. Feel free to link to the download on your site, but please link to the original post for the download (DO NOT use the original files on your site). Cute my fren, very cute! Nice project! Could you please share where at Michael's you got the frame? What's the product name? Was it clearance? I'd like to call ahead and see if they've got it, before I make the trip to the closest Michael's. Thanks! HI! The brand is Studio Decor. 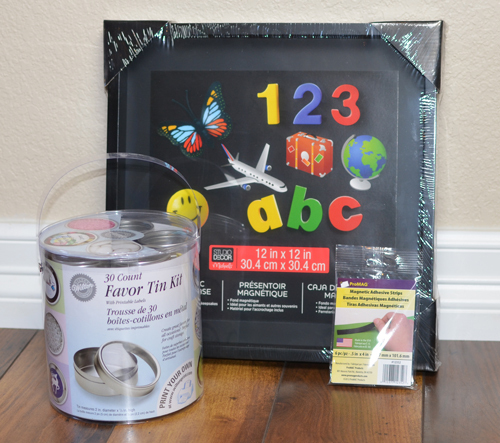 It is a 12x12 magnetic frame. I found it in the frames department, right next to the shadow boxes. I first thought it was a shadow box til I realized it had a magnetic back, exactly what I was looking for! This turned out soo cute! Thanks for sharing. I love that you included the printables. Thanks. I love this idea! 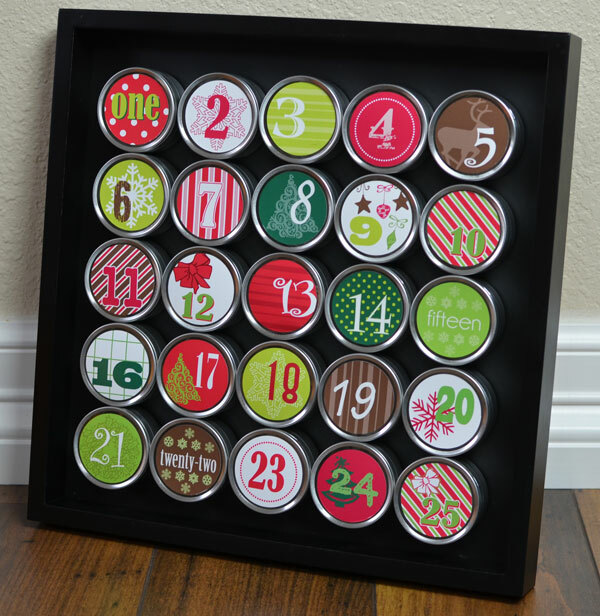 Last year I looked everywhere online for great (easy & affordable) advent calendar ideas. This is definitely one of my faves. So glad I found your blog today, Bridget! This is absolutely adorable...especially how it's not just, like, candy canes or whatever but actual activities to do as a family. Great idea! Oh my gosh, I really love this! And I love how each day has a different activity/goodie inside. I'll definitely do this once I have a family. Thanks for sharing! 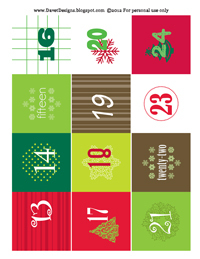 I've seen a lot of advent calendars out there and I think yours is my favorite! I cant find the link to download your printables? Is it still on there? Hi! Love this idea! I'm having some trouble with the Mod Podge. It doesn't come out as evenly clear looking as yours although I have tried to smooth it well. Any hints? Thanks!